picked up another 73 super. body is in pretty good shape with just some light surface rust. i dropped the engine the other day (this was my first time and i really wanted to learn to do it). it came out and went back in easily. my oil cooler was leaking and i needed to change fuel pump to an alt style. apparently i tighten the nuts to much and the cooler leaked but i was able to get the shroud/alt off and redo that pretty quickly and it's good now. i was wanting to learn to do that as well (shroud to tin bolt on driver side is a bugger!). i changed the trans fluid today. old stuff was nasty! anyway, it idles great but when i try to drive it it is terrible. any kind of load on it bogs it way down. i picked this up as a project car and had no idea if the motor was any good or not. i think a compression test will be next. i'm not really ready to try a rebuild but will if that's what it needs. is it a waste of time to just replace cylinders/pistons/rings without getting into the cases? how do i tell if the crank/rods/bearings are ok? i think i have a sticking valve on one cylinder cause when i gave it a valve job it seemed like it wasn't sitting correctly. would this indicate a bent push rod? any advice on engine rebuilds/exchange etc would be greatly appreciated. funds are limited. any rebuild kits recommended? thanks. Last edited by christiancarpenter on Mon Mar 07, 2011 11:51 pm, edited 1 time in total. here's the motor out for the first time. i was quite proud of myself. lol. 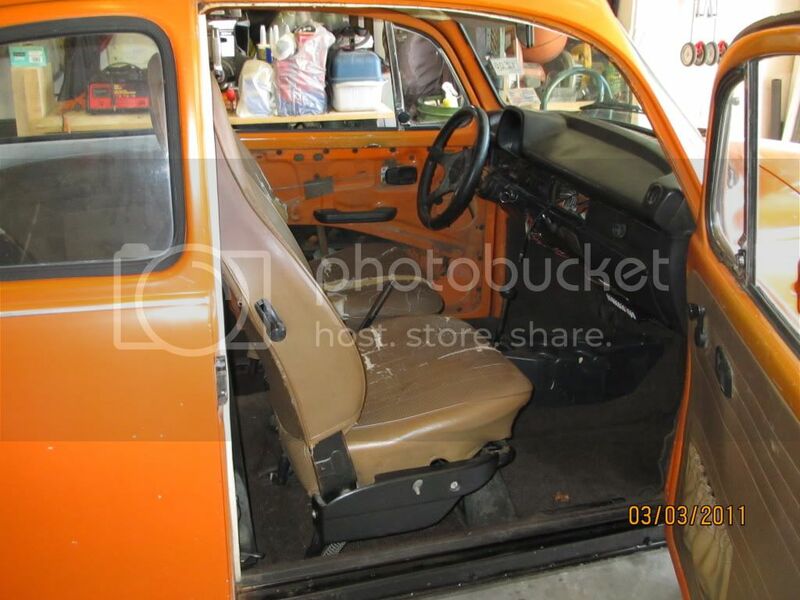 it'll be getting a new interior also. Valve sticking? just pull off the rocker arm and see if the tip is siting the same as the one next to it, maybe a seat issue. If you think 'it' is not sitting right, is that the valve tip, pushrod into the rocker arm cup or??? You can do a top end rebuild, its not a waste, just do it right. But if it runs ok, doesnt make bad metal sounds after the accel issue is fixed i wouldnt waste the time, If it runs, drive it! ALWAYS think simple things first! checked the timing last night. i think it was good. hard to tell exactly cause i have a stock pulley but i had read to messure over 45mm and that would be 30 degrees (009 and 30/31 setup). then i printed out a degree wheel and it aligned with the 45mm mark perfectly so i thought that was pretty good (it was a taste before my mark at 3200 rpms so i think i'm in the 28-30 ballpark). the guy i got the car from said he'd had the carb throat bored out a little to give it some extra power. i hadn't heard of that but since it idles nice i figure it's ok. i'll pull the carb and rebuild it. i don't think the bowl is running empty but it might be too much pressure. how can i tell? as for valve sticking, that might not be the right term, but when i adjusted them, it seemed like one had more movement than the others, which made me think it was returning to its seated position correctly. again, i don't know if my terminology is correct. just seems like strange that it runs well at idle and even backing out of the garage, but when i try to accelerate it falls flat on it's face. if i'm going down the street and not moving the throttle at all, it will jump, like all the cylinders are firing, and then flop again like it's only running on a couple. i'm gonna run over to o'riellys and borrow their compression tester. i'll check the plugs again while doing that. would a bad wire fire normally while idling but then fail while accelerating? has new points and condenser (my first time with those-perhaps i need to study up on setting them correctly). it'll rev just fine while sitting still, but under load just poops out. i'll take any advice. thanks. ahh ok, falls on its face!!! oo9 and 34 pict carbs are known for this prob. most have to run a bit bigger main jet, and or get a vacuum advance distributor. search thesamba.com lots of tips on that prob there. i had an 009 and 34 on my last bug, and it did have the terrible flat spot going into second gear. i switched to a 135 main jet and that helped. but this problem feels like something else all together. like it's only running on 1 or 2 cylinders. i was hoping i was gonna have time to work on it today but i'm not. i'll let you know what happens when i do. thanks for the advice. carb cleaning and compression next. pull the plug wires one at a time while running. See which ones dont kill the engine. then you know which cyl are dead or weak. Sometimes its kinda hard to tell. ok, i 'll try that. it seems like it is running on all 4 when just sitting idleing but perhaps this will give me some insight. every little step closer helps. thanks. If you think its the distributor i have a spare 009 with the electronic ignition in it if you wanna try it. thanks joe. i think the dizzy is ok but i'll keep that in mind. borrowed a compression tester from o'riellys but couldn't get it to thread in cause the hose was so stiff. did tune the carb a little bit better and now it will idle all day long, but still dies when i try to drive it. tried pulling the wires one at a time and each cylinder is firing at idle. kinda stumped. gonna check valves again and do the plugs and wires thing. got a picture i wanted to share and see if anyone has any insight. it's the inside of the trans case and you can see where the flywheel had dug into the case (on bottom and at the lower bolt castings). i found that when i pulled the motor and don't know if it is old damage or is from this current setup. 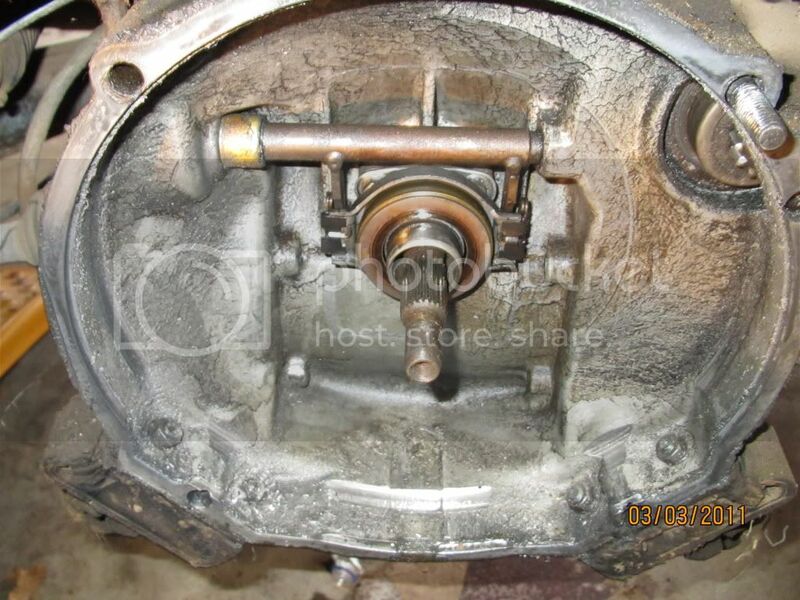 the flywheel doesn't seem to be chewed up and the starter engages it fine. any ideas/concerns? clutch works fine, although it engages very quickly when it gets there. thanks. make sure the flywheel and clutch is tight. It could have came loose on the previous owner but that looks fresh to me tho. ok. i have a feeling i'll be pulling it again soon. i didn't get into the clutch and flywheel when i last had it out cause the clutch seemed to be working and there wasn't any oil leaking from the main seal (that i noticed). i think when it comes out next time it will be getting alot of attention (last time was my first time and it was as much about learning how to get it out and in as anything). gonna have to wait on some funding to come through but want to at least do a top end rebuild. it made that mark when you pulled it im sure. im sill leaning twards carb or dizzy, especially since you said previous owner bored the carb, whatever that is. Check front to back movement if the crank. Had a friend in Las Vages when I was station there that had the sams problem and he had the rear crank shaft bearing that bad. hey dubbers, was out of town for a week but had the carb soaking while i was gone. got it back together and installed tonight. it ran much better than it has since i aquired it. still not right, but a drastic improvement. i also put new wires and air filter in so i'm not sure if one of those things was the culprit also but it is better. one problem i found it that my main jet says 120. i figured it would be at least a 125. gonna get a 135 to go with the 009 and see if that helps it out. it is a complete dog going into second gear. also when i was pulling plugs again i had an insert come out with one of them (didn't know it was there). i cleaned the plugs up real well and put them back in but i'll need to get another insert when i get new ones. is that a standard size? should i just bring the old one in with me? also have a pretty good super shake going on (first time i felt it since it was the first time i got any real speed out of it). if it ain't one thing....lol. finally, since the cylinders have lots of old oily junk on them the car is smoking pretty bad when i park it. it shoud be pretty safe to let that stuff burn off, right? it shouldn't spontaneously combust right? i'm thinking it is just gonna need to be driven to clean some of that off. hope you all are doing well. as for the excess oil burn off.....................let her idle OUTSIDE the garage and watch it, But yeah it should burn off if you do not have any leaks. 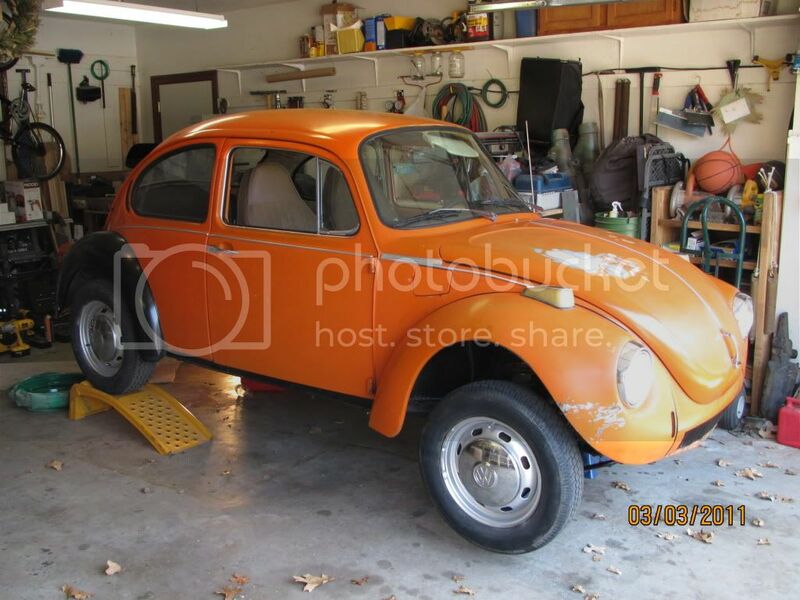 Welcome to the joys of a super beetle, you will spend hundreds of ours and dollars thing. To stop it. Inserts are not normal in the head. Was it tapped in and the threads pulled? If so you'll need to pull the head to do it right. it threaded back in just fine. probably an excellent example of why we should use antisieze on plugs. as for fumigting, it didn't take my wife long before she came out to see what the smoke smell was. lol. question: anyone know what size drill bit would make that little 120 jet into a 135? i can get one at the shop but thought i'd give it a shot since it's too small anyway. i also have a torn boot on one of the axels. is it best to replace the whole axel or just put a new boot on it? no telling how long it's been open and run dry. im wondering if that might be contributing to some of the grinding feel. gonna repack the front bearings and make sure the back axel nuts are tight enough. other than that i can't seem to isolate the grind. Anti-seize is good stuff. Might locktight in the insert. Drilling jets is pretty tricky. Might call shawn he has some for sale on craigslist right now. Jack the car up by the shock mount to give the correct angle for the rear suspension and spin the wheel, see if its a axle bearing or CV or trans. Might even drive it, like 40mph, turn off the car in neutral and listen, thats usually what i do. You can put just a boot on, the CVs are pretty strong unless theyve been ran without grease along time, and of course if you do it, put both on. Pay special attention to the bolts, clean them really well and check to see if they are the star bit or allen bolt. there are 2 types people use over the years. ron has jets at bethany if shawn dont have the right one also. i found a 127.5 i had taken out of another carb i while back. helped a ton. think i might still go visit ron and get the 135. think that will be to much? i addressed the wheels today and found a few issues. the front bearings needed to be packed and one of the rear nuts wasn't anywhere close to the right torque. hard to tell exactly where i am using the sledge hammer and axel tool, but i hit it once and it loosened right up. other side took 7-8 good blows before it got loose. i inspected the splines and all looked good. put it all back together and it feels better. something still kinda funny but it's getting better each day. also while i had the front wheel off i put a new speedo cable in and now have a working guage. woo-hoo. on another topic, i got a call today and have officially been hired by the okc fire department. been doing emt training and trying to get on for 2.5 years and it has finally happened. hopefully i'll never be called to hose down your engine compartments. lol. BUT if they are a goldish brown that is what you are lookin for. On IRS cars the rear drum torque isisnt as critical, as far as making noise USUALLY. The VW is an easy animal as soon as you un-screw previous owner problems. another quick question. haven't run the bug since last time we talked but just took a look at things as i was walking out of the garage and the alt belt seems to be a little loose. could the drop in temp the last couple days be resonsible for this? i can't imagine things shrinking up this much with the cold front but i have experienced shrinkage before so i suppose it's possible. they are free also. And still in the wrapper. matter of fact i am gonna need to do some front end work. lol. she shakes pretty good around 35 but i'm fixing things one at a time as i gather funds. definately need a ball joint on the bottom of the driver side strut. will that require a new strut or just the lower portion? i'm wondering if my crank pulley is bent and that's why my belt was loose. that could also cause some of that vibration, eh? i have another stock pulley i could try. maybe that will fix it. missed thefree part. I'll take them!!! lol. maybe i can repay you with something i got. new issue. took her out for some laps around the block today as i'd tweaked the carb a bit more. got home and noticed the belt had turned itself inside out! took the belt off to see what size shim i needed behind the alt pulley. grabbed the crank pulley to check for movement (end play, correct? is this what you had been referring to firefly 77?) anyway, pushing and pulling, i have at least an 1/8 inch of movement. that's way to much isn't it? been reading samba stuff about it and it says .003-.005 is what i'm looking for. so the motor is coming back out tonight. i have a bunch of body/interior/front end work to do anyway so i'm gonna try to slow down and get a more methodical method going on over here. need some guidance here though. i'm thinking everything will be coming off the block and getting a good cleaning/painting/inspection. i'd like to get new rings in it (do i have to put new cyclinders/pistons for a good top end job or will rings suffice if nothing is trashed? should cylinders be bored?). the trans/clutch have been acting good so i think i'm okay there. i need a new axel (or at least boot). is that much movement gonna neccesitate a complete tear down? 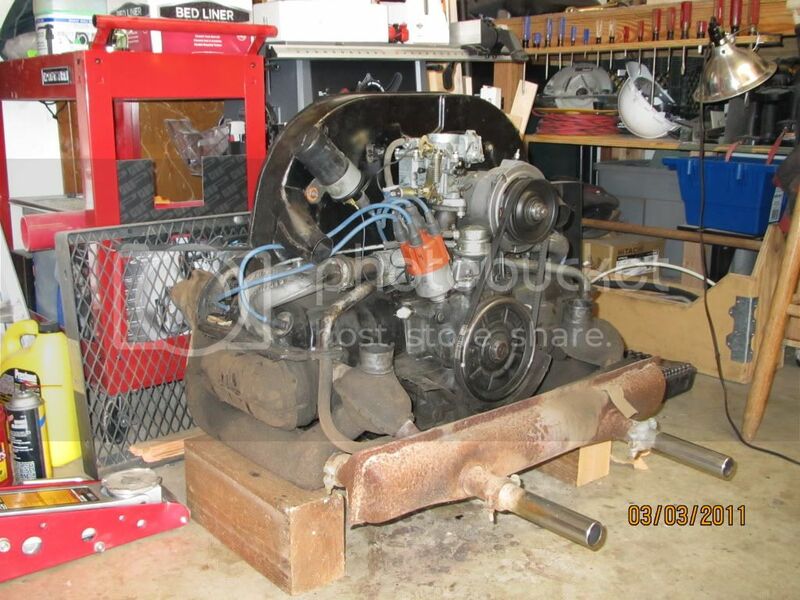 can it be straightened out with the shims behind the flywheel? never been that far into one before. otherwise things have been going well with it. brakes are good. electrical is all straightened out. charging system works fine. starting system works fine. just need to get motor straightened out. even there, it's running pretty good, i just know something isn't right though. don't have tons of loot to tthrow at it right now but want to do it right also. tips? You should have a second set of eyes look at it also, You never know could be something simple. Meh, if it runs well i wouldnt worry about it. Put a new belt on and adjust the play correctly with the shims. They are all the same thickness. If your going to take the engine out and do a top end, DONT do just rings, spend the 150 and get non-chinese pistons/cyl, might as well put bearings in the case and get endplay and line bore checked. Or if it runs and you dont have $$ drive it. Let's move this to the discussion forum. Yes, eighth inch is too much, and it won't heal itself. You should have every manual you can get your hands on before tackling any more on the engine. Get the proper tools will help immensly. Then don't think a new top end will solve everything, if the lower end is worn that much and you stack good compression on it, something will give. That's just the cold hard fact, vws are more prone to this than say a chevy v8 because of the way and material they are made of. Stay with us, we're here to help. See ya over in discussion.....JP oh yeah, I forgot, quit hammering on the axle nut, get a tool to remove it....congrats on your new job too!!!!!!! Weren't you gonna call me back ???? Or did i forget to call you back ? sorry joe. had a bunch of stuff come up and had to put the car on the back burner. started working on it a couple days ago though. i'm gonna switch this over to the discussion section now so look for a "bearing question" post.